Sciency Thoughts: Massive Ghost Net seen with thousands of trapped Fish and Sharks in the Cayman Islands. Massive Ghost Net seen with thousands of trapped Fish and Sharks in the Cayman Islands. A massive Ghost Net (abandoned or lost fishing net) has been sighted this week in the Cayman Islands. Diver and fisherman Dominick Martin-Mayes and companion Pierre Lesieur reported seeing the floating net about 4 km to the north of Grand Cayman Island on Monday 16 April 2018. 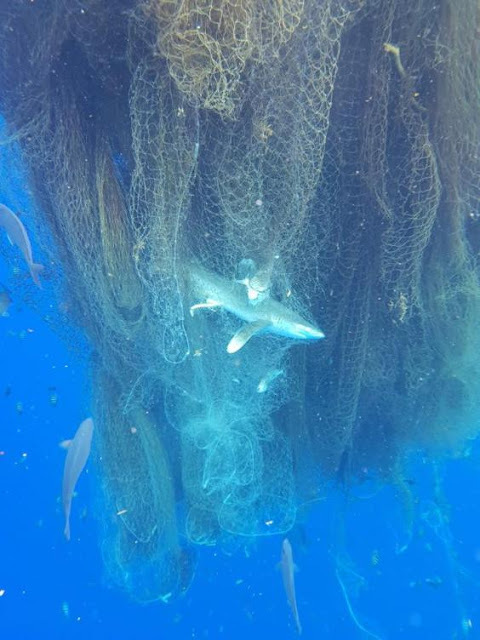 The net mass is estimated to be about 15 m in diameter and about 15 m deep, and contains thousands of trapped, and mostly dead, Fish and Sharks, suggesting that it has been in the water for a long time. 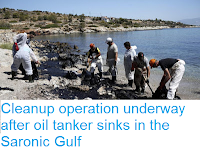 The government of the Cayman Islands has issued a alert to shipping in the hope of relocating the net and tackling it. Ghost Net sighted in the Cayman Islands this week with thousands of traped Fish and Sharks. Dominick Martin-Mayes and Pierre Lesieur. Ghost Nets are considered to be a major threat to marine life, trapping thousands of Fish, Sharks, Crustaceans, Marine Mammals and Reptiles, Birds and other organisms every year. Nets are essentially designed to trap and kill Fish, and abandoned nets generally continue to do so very effectively, indeed they are often more dangerous than nets in use, as the abandoned net becomes filled with dead animals, the scent of which attracts more scavenging and predatory organisms, which then in turn become trapped.